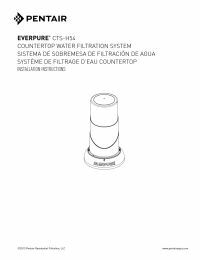 The Everpure CTS Series Countertop Drinking Water Systems pack 60+ years of commercial water purification performance into a footprint smaller than most coffee makers, with a design that attaches to a standard faucet in seconds. Even though it's compact in size, the portable CTS-H54 offers full-size capability to filter out the contaminants that may affect health, and give water an unpleasant flavor and bad odor. 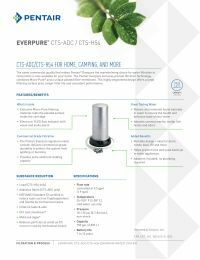 The Everpure CTS-H54 Countertop Drinking Water System gives you great tasting water - all you want, on demand - for cost that's far less than bottled water. Everpure’s exclusive precoat filtration technology combines Micro-Pure® and a unique pleated filter membrane to reduce particles as small as 1/2 micron (1/50,000 inch). 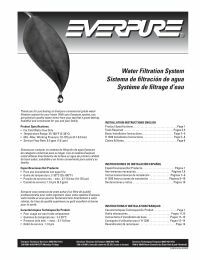 This highly engineered design offers the largest filtering surface area, longer filter life and consistent performance. Everpure systems reduce contaminants, yet retain vital minerals found naturally in water, so your water tastes crisp, clean and refreshing.